But this is not the heat of the story (though perhaps the core of the series), and the minor role of President Snow (Donald Sutherland) in The Hunger Games is expanded upon. In Catching Fire, President Snow is acutely aware that Katniss is a threat to the dystopian world he controls. “You fought very hard in the arena, but they were games” he tells Katniss – which is strange because, the whole point of The Hunger Games was that though named as ‘games’ they actually were life or death. But we’ll ignore that because President Snow is an arch enemy. He is the Goliath to Katniss’s David. 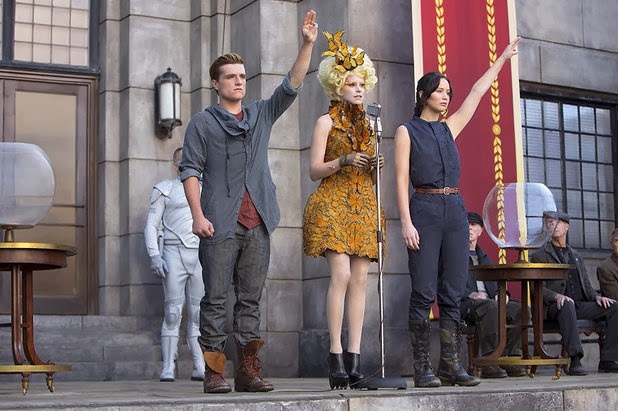 Stakes are higher and Peeta and Katniss are bound to each other as they travel the districts and witness the brutal state of the world. They see an old man raise his hand in support of rebellion before faceless militia murder him in front of the populace (though not in front of us). The tour comes to an abrupt end when President Snow announces the unique set-up of the 75th Quarter Quell … involving our favourite duo again. This time, rather than fighting random players from across the districts they are against the toughest and dangerous players of the previous games: the surviving winners. Former friends of Katniss re-appear in Woody Harrelson’s ‘Haymitch’ and Lenny Kravitzs’ shamen-like fashion-designer Cinna, while Philip Seymour Hoffman’s game-maker has such a commanding presence, we pray he survives the film. Some moments almost give a sense of deja-vu as Katniss has a dress that bursts into flames while sat upon a Ben-Hurchariot and even the players are expected to be interviewed by Stanley Tucci’s eccentric game show host Caesar again (His pearly white teeth have never glistened so brightly). Indeed, recalling the first film, the vast majority of the film is spent prior to the games. By the time Katniss arises to stand amongst the players in the simulated environment, you only wish it could’ve balanced its time better. Learning from its predecessor, Catching Fire could’ve immediately started within the game (possibly flashing back to answer the ‘how’ question). Teenagers will surely watch the two films back-to-back and notice the similar structure. Catching Firewill inevitably be appreciated almost-exclusively by the teenage target-market it intends to reach, but despite this, it tries to raise larger issues. In a world whereby an ex-presenter of reality TV-show Big Brother has touted an idea about rebellion while a Conservative Government runs the country, the relevance cannot be ignored. 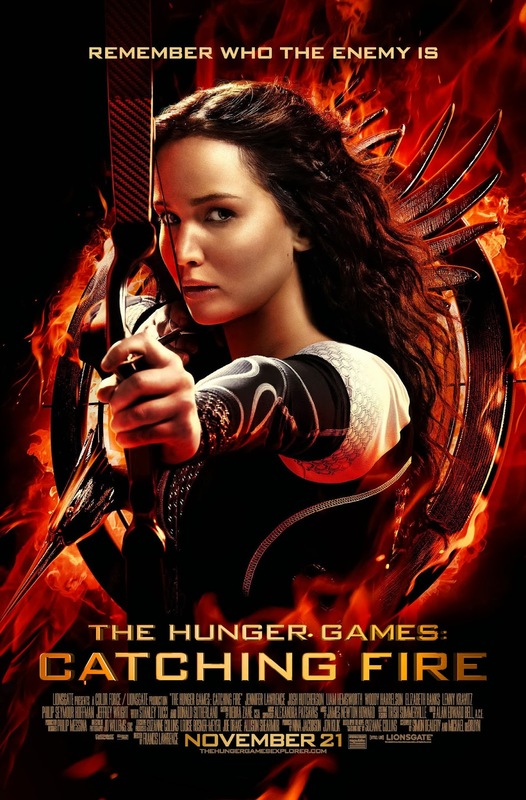 Fans of Katniss will hopefully connect the dots between the media, the government and rebellion – and its relevance to 21st Century politics. In that manner, Catching Fire, though openly playful about its connections to fantasy in man-eating baboons and skin-burning gas, it will start a dialogue and light a match in the minds of the young. Let’s hope Hollywood handle this carefully though, as Catching Fire only raises the questions – the further sequels will answer them.